Thus went a familiar refrain when we were kids and instead of peanut butter and jelly we opened up our lunch box to a liverwurst sandwich. No one, and I mean no one, would trade their sandwich for ours. Even now, just say the word “liverwurst” to an unsuspecting friend and watch their reaction. I suspect that if it were called “saucisse de foie de porc” (sausage of pork liver) we wouldn’t have had such a problem with it. But with the combo of “liver” (not every kid’s favorite meal) and “wurst” (sounds a lot like “worst”, as in the worst sandwich ever), we were not predisposed to like it. Seriously, liverwurst tastes a lot like pâté, and is usually made with pork, including up to 20% pork liver. Prepared well, it is absolutely delicious. The question is can you even find it in the stores anymore? We recently found some fantastic liverwurst a local German sausage maker (Morants in Sacramento). Underwood is a brand I remember growing up, though I don’t know how available it is these days. Liverwurst sandwiches are typically made with rye or whole grain bread, mustard, and onions. Personally I would skip the onions, unless perhaps they are pickled red onions, as the liverwurst is strong enough in flavor and often has onions ground into it. We always had these sandwiches on white bread growing up, so that’s what I use now, but with Italian or French loaf. Spread bread slice with mayonnaise (and mustard if you prefer), layer on the lettuce, liverwurst slices, and pickled red onions (if using). Top with bread slice. Hello! All photos and content are copyright protected. Please do not use our photos without prior written permission. If you wish to republish this recipe, please rewrite the recipe in your own unique words and link back to Liverwurst Sandwich on Simply Recipes. Thank you! Spread your wurst on hamberger buns or bread and top with sliced Velveeta and Broil…..the absolute Best!! I figured to show you one of my jars of Zure Leverworst made with my recipe posted earlier in this string..
We always had them on white bread as kids with mustard, lettuce, Miracle Whip, and slices of homegrown tomato from the garden. A sweet or dill pickle and some potato chips on the side–a wonderful lunch. Now I sometimes eat it sliced on buttered toast with a dusting of, (believe it or not), garlic powder–now that’s heaven. Sometimes I’ll have that for breakfast. I got liverwurst at publix in Florida and I put it on sourdough bread with onions soaked in robusto Italian dressing, absolutely wonderful. I love liverwurst sandwiches too. Our family’s traditional sandwich is liverwurst, sliced red onion, and blue cheese on rye bread. Some also add garlic sausage. Rule is – everyone present has to have one! For me, a sandwhich needs to be balanced, i.e., with nothing overpowering anything else. Liverwurst is a very rich meat so I stay away from mayo, butter and cheese, all of which are already rich. Mustard and onions are too strong, too, and robs the liverwurst flavor, I think. I am biased towards white bread. But I would be temted to try a multi-grain bread for my liverwurst sandwhich. MG bread is “rich” too, I guess, but it seems to have a flavor and texture about it that just may compliment the liverwurst. Until, then, the only thing I put on my white-breaded liverwurst sandwhich is chilled iceberg lettuce. It is refreshing and balances the richness of the meat. The egg salad and liverwurst sounds like a great idea. Where I live, liverwurst products are really soft, while braunschweiger tends to be more firm. I go through a pound of braun a week. Try it sliced and served with sharp (12-month aged or more) cheddar, apple slices, and ritz crackers for a great snack. Braunschweiger on pumpernickel with onions, some nice kosher dill slices, a few slices of roma tomato, a little mayo, and a little german mustard is sandwich heaven! Egg salad with small bits of liverwurst mixed in. A 100% must try for liverwurst lovers. My gramma used to make it. My husband wrinkled his nose at the idea, but LOVES it! The best is from Usinger’s in Milwaukee. You can order on-line but if you’re in the area, you can go to the outlet store. Got Liver Pate today for $1.99/lb. They also sell, from Miller’s Bakery, Pretzel Rolls (like large soft pretzels). Fantastic with liver sausage! Otherwise, if you can find it…..sauerkraut rye bread! Yum-O! And it is good fried! (the liver sausage). All with sliced Vidalia onion. Different between liverwurst and braunschweiger? …. Liverwurst if fresh and braunschweiger is smoked. I Love Liverwurst. I never had it as a kid only when I met my husband. They have it on toast, I like wheat, or honey wheat, with ketchup. That was I knew to eat it, but, been experimenting and I was going to make an egg sandwich for breakfast so I quick panfried a slice of liverwirst then put it on the side, fried an egg(over easy) put the LW back in the pan egg on top and some shredded cheese on top cover for a min maybe, so the cheese melted OMG it was so good. Sandwiches I like Spicy Mustard, wheat bread and thin sweet onion. Growing up a favorite breakfast would be braunschweiger fried with an egg. On top of rye toast it is heaven. It’s the type of food that you either love or hate. I still love it. What about livermush? I never had it until I was 28 but Neeses brand livermush or “liver pudding” is awesome browned on each side and put on toast with a slice of onion and mayo. I just recently had liverwurst for the first time (since I’m from the south and I never heard of it before) and I liked it. It’s got more of a “lunch” taste rather than the livermush “breakfast” taste so I will have plenty of both from now on. I grew up with Liverwurst in the Cincinnati area. I moved south to NC and tried livermush, but it just does not agree with my taste buds! Of course I have only tried it at the State Fair a few times. That was the best I ever had. Today I live in the sun-belt. Anyone else have a favorite? 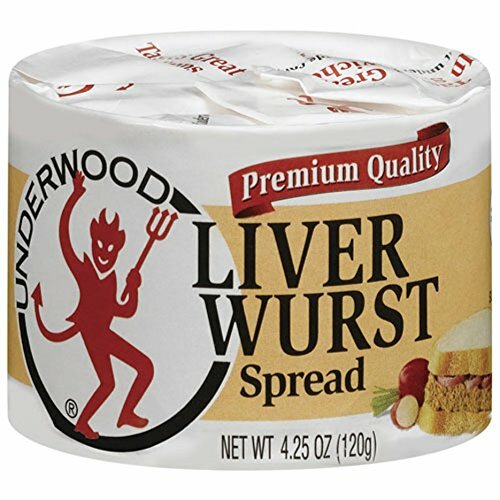 Underwood Liverwurst can be found at most Asian food stores. We use it in our stews. I love liverwurst sandwiches! I’ve been buying the two kinds of liver sandwich spread, both by Farmer John, one is Liverwurst (green label) the other is Braunschweger with Liverwurst in smaller letters. They do have slightly different flavors. Also tried the Oscar Meyer. Been using the lock and lock containers to keep in the fridge. Have succesfully frozen the rolls when I find a good deal on them. Will try the Boar’s Head at the Kroger deli, didn’t know it existed. Living in Chicago in the 30’s & 40’s was a wonderful taste treat. Corned beef on rye sandwiches with a pickle on your walk to Humboldt Park. The deli on Division and Damen, Sheska’s (not the right spelling), all kinds of wonderful salamis. There also was an Andes Candies that served ice cream sundaes, hot fudge and strawberries in season.World War II changed a lot of things. I think more fresh fish was eaten. Meat was unheard of, once in awhile my Mom would get some neckbones and make spaghetti sauce, that was the highlight of the week. My favorite snack was roka cheese in a cardboard tub spread on rye krisp. I think those were one ration point and you could get those. Went to high school on the South side where ethnic stuff was sort of looked down on. Most of the time my Mom made cheese sandwiches with butter on white bread for my Dad and me. Sometimes I would get a liversausage on white with mayo and lettuce. I would buy a bag of bbq chips and a coke. It was delicious. Still like it that way, don’t put as much liversausage on, more lettuce, still the mayo but use the different healthy breads. Only have the chips on special occasions. I also have a picky eater pup. I can roll her meal in a small amount of liversausage and she thinks that’s wonderful, it’s the only way to get her to eat meal. On occasion we make real liver, always with the onions, lately with garlic powder.